Getting a swimming pool is a big decision for a household. Not only is it a rather expensive addition to a house, it will also change the face of your yard. After the pool is installed, you will need to redo the landscape around it, and often you will need the services of a fencing contractor to take care of the regulatory fences around your new addition. To get the best out of your new swimming pool and yard, get a good pool cleaner and plan a nice landscape around your new acquisition. First, along with your pool, you should choose a great tile for the patio area around the pool. Keep a space near your home, between the house and the pool, to set up your outdoor furniture. Ideally this space should get a lot of sunshine during the day, as well as your pool. This will help keep your pool warm and your patio inviting. But there’s nothing wrong with more shade, if you like it; you might just need to have a pool heater if there is not enough sun to warm your water. There is now excellent outdoor furniture that rivals indoor furniture, with a big choice of materials, fabrics and colors. The patio is the space where people will sit down, relax and eat during the warm months of the year; it is important that it is inviting and comfortable. 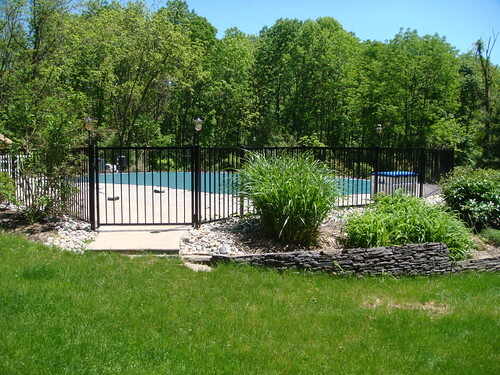 In many cities around the world, fencing is required when a pool is installed on a yard. This is to prevent children from inadvertently finding their way to your pool and accidentally drowning. You will probably then have to fence your entire yard or, if it’s very large, the pool area. You will need to keep your yard locked when there are no adults around. There are many styles of functional AND good-looking fencing. Wood is cheaper but requires more maintenance; metal is easier to manage but is more expensive. Choose what fits your landscape and your budget. Now for the best part: the actual landscaping with plants. Plants help keep some privacy around your pool, especially if you have close neighbours. Trees will provide areas of shade, and they are best placed around the patio; they can be a bit of trouble around a pool, especially if you live in an area that has four seasons and where leaves fall in autumn. Avoid fruit trees as well: the flowers and fruit attract bees and other undesirable insects. Choose low-maintenance plants. Plants will help soften the lines of your pool, hide the pool equipment and otherwise beautify the area. As you can see, landscaping for a pool area is easy if you know where to start. Plants will hide that ugly pool pump and will provide nice shade areas and some privacy. Moreover, good fencing and an inviting patio are also important features of a pool landscaping project. Make a plan beforehand, and adapt to your budget and to the products available in your area. Also consider the seasons in your region: an all-year pool area will be different than one set where there are 4 seasons: planning for 3 months a year is different than for 12. Most of all, have fun and choose a landscape that pleases you and your family first!